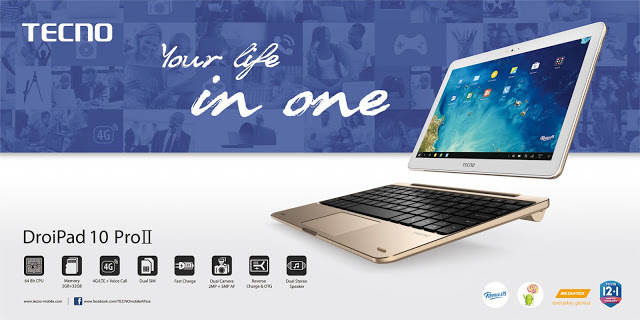 Do you need a Notebook that runs on Android OS, with Dual Sim, 4G LTE Network capability, long lasting battery, big screen size and a beautiful physical keyboard that works with most "Windows" shortcut? See full specs below. TECNO Droipad 10 Pro II, the world’s first Android 2-in-1 device has it all and it is now available for sale in key retail outlets in Lagos Nigeria for just N100k limited time promo price (Check details and list of outlets below) . 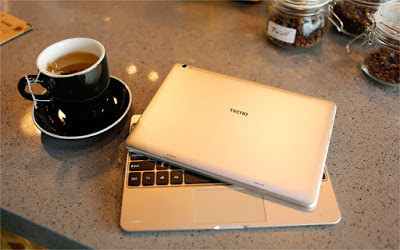 The device is officially set to be launched by the Tablet Unit of TECNO later this October. This combines the productivity features found in the regular PC, Windows for instance, with the ‘start button’ called the app drawer, task-bar, easy multitasking between multiple resizable tabs or “windows”, sidebar notification, drag and drop files, and the conventional keyboard short cuts many PC users have become familiar with. This is basically and brilliantly making PCs more mobile. The 2-in-1 body device is built for speed with a 1.3GHz quad-core processor and flaunts a vibrant 10.1’’ IPS touchscreen with full lamination that delivers stunning colour consistency, plus an inbuilt 32GB storage capacity to hold your multimedia content and a 2GB RAM that enables faster responses when multitasking. Promo Price Till 31st October, 2016: Where to Buy? TECNO is organizing a promo in key selected outlets starting from Monday the 17th which is slated to run through the ending of October, 31st, during this promo, we have been reliably informed that the DroiPad will be sold for N100,000 with lots of freebies. The TECNO Droipad 10 Pro II comes bundled with a leather pouch for comfort and safety whilst buyers will still also win instant gifts such as Bluetooth Speakers Wireless Mouses, Power Bank, Selfie Sticks, Umbrellas and Sunglasses. The grand prize for this promo is a flat screen plasma TV which will be won at the final day of the promo. Aside the Remix OS upgrade, the next amazing specs is the monster battery. The DroiPad 10 Pro II comes with a powerful 7000mAh battery capacity that can enable users enjoy productivity and video playback of up-to 11 hours in a single charge. 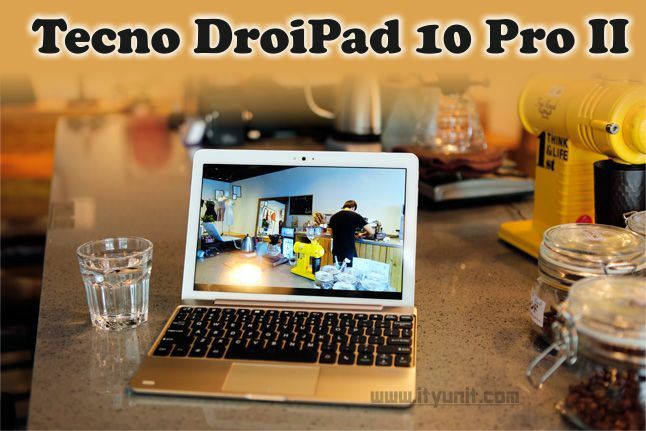 The DroiPad 10 Pro II comes with a free beautiful detachable keyboard. This wireless accessory is essentially what converts the DroiPad 10 Pro II into a mini PC. For lovers of physical keyboards, this is the real deal, as typing is pretty easy without hassles. The shortcuts found in our regular PCs work perfectly on this device, thanks to this detachable keyboard. 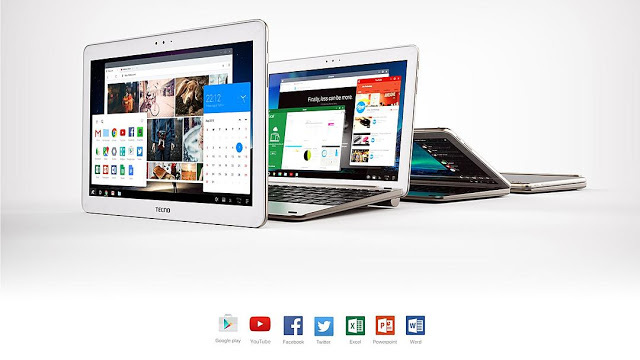 The specs of the DroiPad 10 Pro II may not compete with high end notebook devices, but the freedom and mobility options this “All-in-1 Android Tablet-PC” offers are features that make it a first choice for every class of mobile PC lovers, especially for business-on-the-go applications.